COPA Hydrophilic Foam Dressing is an ultra soft Wound Dressing that is highly absorbent and protects and cushions wounds. 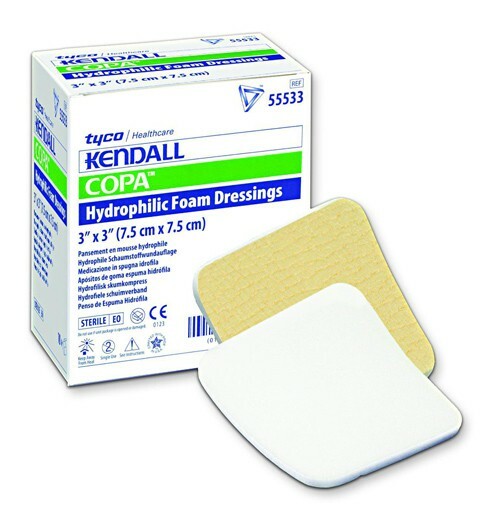 Manufactured by Kendall, the COPA Foam Dressing is designed with small pores that decrease the chance of tissue migration into the foam dressing and helps to reduce skin maceration. 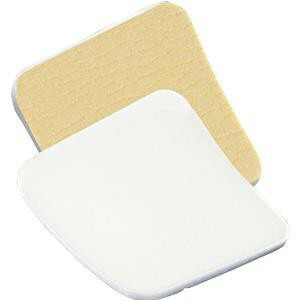 Available in several size selections starting at a 2 inch square dressing up to an 8 inch square dressing to meet the needs of the patient's wound size. High fluid capacity exceeding Allevyn and Polymem dressings. Ultra-soft hydrophilic foam protects and cushions wounds. Small pores designed in the foam dressing decrease chance of tissue migration into foam dressing. Provides maximum patient comfort with soft cushioning. Width Options: 2 Inch, 3 Inch, 3.5 Inch, 4 Inch, 5 Inch or 6 Inch. I like the fact they can be cut to the exact size I need to make a good wedge to put betwwen my husband's toes to keep diabetic blisters from forming or to just keep the toes that are rubbing from forming blisters. He can dispose each wedge every night. Flexible foam dressing is easy to shape and apply to any wound. Very nice to have it already cut. Seems to help husband. Ordered the 2x2 and the 4x8. I really like having the 2x2 as it is quicker for me to get the dressing applied. My only problem with this product was that I did not realize that they were not "self-adhesive", not being a medical professional. My visiting nurse did show me how to make them work for my situation which is significantly cheaper that purchasing the "adhesive" ones!! Other than that, the product is 100% satisfactory! I fell on the ground and got some wounds in different parts of my body. It came in quite handy because it was not hard to shape to apply over wounds. Texture is smooth so you don't feel sore over it. Also nice shipping. Could get it earlier than I expected. No comment, did not receive. This is the only item I did not receive. The other two items , that we ordered were received on different days.